This late nineteenth-century depiction of Philadelphia, engraved from sketches by Theodore R. Davis, shows Windmill and Smith’s Island in the foreground. The islands were never more than sparsely settled. Through most of their recorded history the islands played host to dirty industries such as the storing of coal, and a lead works. The islands also served as the home for several riverside resorts. Including David Warren’s Point Airy resort in the 1850s, and Jacob Ridgway’s Ridgway Park in the 1870s and 1880s. 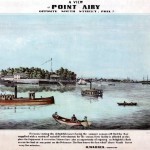 David Warren operated the Point Airy Hotel and Dock at the southern end of Windmill Island and promoted the hotel with this advertisement. Visitors could find his resort equipped with a “bar supplied with a variety of suitable refreshments,” or perhaps the resort-goer would take a swim in the Delaware. In 1838, a 130-foot-wide canal split Windmill island in two. This watercolor by David J. Kennedy captures a view of the New Jersey side of the Delaware River in 1863. The smaller eight-acre northern island became known as Smith’s Island, taking its name from a Captain John Smith, who lived on the island with his family. Though it was named, many people did not recognize the distinction between the two islands, and the pair were inconsistently called Smith’s Island or Windmill Island until they both were dredged out of existence in the 1890s. On Smith’s Island, a dock for Ridgway Park is visible to the right of the boat in the foreground. The park was built by Philadelphia entrepreneur and politician Jacob E. Ridgway, who envisioned it as an inexpensive, healthful, and pleasant park for the “respectable masses.” This vision did not come to fruition however, with rowdy fights and drunken scuffles evolving at his resort. When Pennsylvania enacted stringent “high license” liquor laws in 1887, the sale of liquor on the island became illegal, and the resort lost a share of its appeal to recreational visitors. Once a prominent feature of the Delaware River between Philadelphia and Camden, Smith’s and Windmill Islands were shifting signifiers of the recreational, commercial, and financial development of the region. Originally one island, then segmented by a canal in 1838, the islands attracted early but unsuccessful proposals for bridges between Camden and Philadelphia. 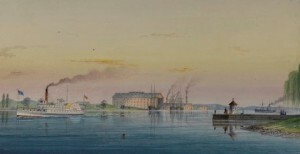 Although they served as a summer resort for the working classes for much of the nineteenth century, the islands became viewed as an impediment to the growth of the harbor and expansion of commerce. Between 1893 and 1897, dredging removed them. The presence of a land formation in the Delaware River was noted by Thomas Holme (1624-95), the first surveyor general of Pennsylvania and designer of Philadelphia’s street plan, who observed “muddy mounds” opposite the city. Over the years, sediment, sand, and silt from the river accumulated on these shoals to form a single, twenty-five acre island. The hull of a ship, discovered later by dredgers removing the islands, may have contributed to the accumulation of sediment and debris and the formation of the island. In 1746, John Harding (1700-47), a miller, erected a wharf and a windmill on the island, thus giving it its first popular name: Windmill Island. For several years, farmers brought grain to the mill at low tide by crossing over the sandbar that had formed between Cooper’s Ferry (the future site of Camden, New Jersey) and the north end of the island. During the late eighteenth century, the island was also the execution site of several criminals convicted of murder or piracy. After the Revolution, Pennsylvania and New Jersey signed a treaty that divided the islands in the Delaware River between them. Pennsylvania took ownership of Windmill, while New Jersey controlled Petty Island, two miles to the north. In 1791, the Pennsylvania Assembly authorized selling several islands in the Delaware River, including Windmill, thus making tracts of land on the island available for sale to businesses and individuals. As early as the 1820s, Windmill Island became a site of leisure and recreation. With its willow and maple trees, it offered a cool respite from the summer heat of the city. By 1826, it even featured “floating baths” similar to those that became popular at the Battery in New York later in the century. 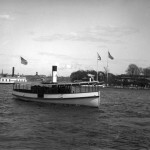 From the 1840s through the 1860s, the island became a widely publicized viewing point and starting line for yearly summer regattas on the river. The island’s position between Philadelphia and the developing site of Camden created an obstruction for ferry crossings but inspired proposals for bridges. 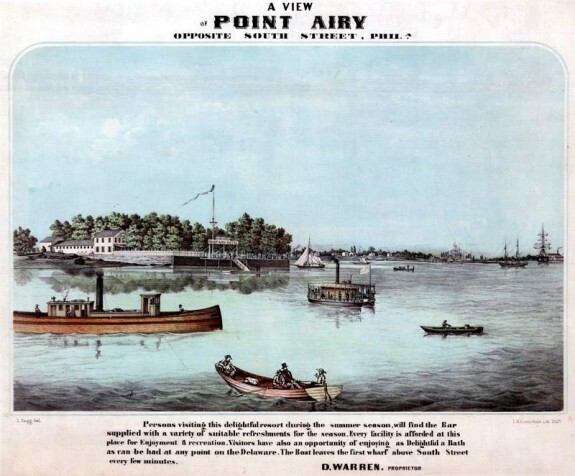 In 1819, politicians discussed building a bridge linking Windmill Island to Camden. The previous year, Edward Sharp (1769-1834), developer of a ninety-eight-acre “Camden Village” addition to Camden, purchased seven-tenths of Windmill Island with the expectation that a bridge would be built from his properties to the island. Despite support from the New Jersey legislature, the bridge was never built, primarily because of insufficient funding. The plan also met resistance from boat captains and pilots, whose livelihood depended on water transit. In 1868, Thomas Say Speakman (1817-97), a civil engineer and native Philadelphian living in Camden, devised a plan for a double-draw, stone suspension bridge connecting Camden with Philadelphia via Windmill Island. 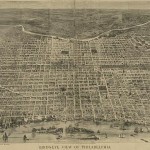 Despite resistance by the Philadelphia City Council and initially by Philadelphia port wardens, the U.S. Congress endorsed the $2 million project so long as the bridge would not “obstruct, impair, or injuriously modify the navigation of the river.” The bridge was never built, however. The Philadelphia and Camden Bridge Company, which was responsible for implementing the plan, did not meet the timetable authorized by Congress. Consequently, the company forfeited the right to construct the bridge in 1876. Windmill Island eventually saw the building of eight structures, including a coal depot and a lead works. It was also considered as a possible site for storing oil. David Warren (1800-?) 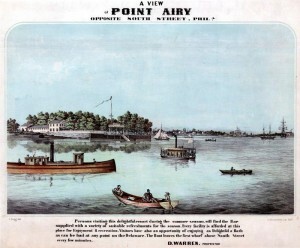 operated the Point Airy Hotel and dock on its southern tip. A portion of the island also became a health resort for children. In 1877, the Sanitarium Association of Philadelphia transported children and their mothers to the island from hot, congested Philadelphia neighborhoods to enjoy recreation and free bowls of soup. Called “Soupy Island,” this summer resort moved in 1886 to Red Bank in Gloucester County, New Jersey (where it became the Sanitarium Playground of New Jersey and continued to offer summertime programs for children in the twenty-first century). 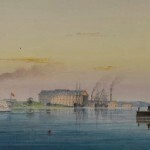 Smith’s Island, meanwhile, developed a reputation as a refuge for the “idle and dissolute.” Philadelphia entrepreneur and politician Jacob E. Ridgway (1824-1909) sought to change this when he purchased Smith’s Island in 1879 for a reported $55,000. 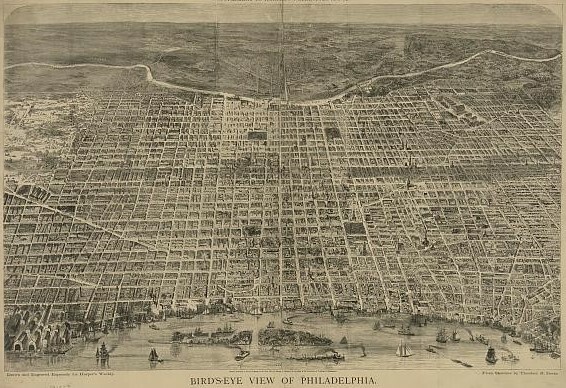 The next year he renamed it “Ridgway Park,” which he envisioned as an inexpensive, healthful, and pleasant resort for the “respectable masses.” Herman J. Schwarzmann (1846-91), an engineer for the Fairmount Park Commission and architect of buildings for the 1876 Centennial Exhibition, helped reshape the island’s gravel walkways and rebuild the structures. A dancing pavilion was converted into a roller-skating rink, and a rundown saloon became a hotel. Two large, separate baths—for men and for women—could hold hundreds of swimmers. The park featured a bowling alley, hot-air balloon rides, tightrope-walkers, musical concerts, and a beer garden. Ridgway hoped his resort would ultimately become the Coney Island of Philadelphia. In time, rowdy fights and drunken scuffles became common, and the park was cited for prostitution. After Pennsylvania enacted more stringent “high license” liquor laws in 1887, sales of liquor on the island became illegal, and the resort lost much of its appeal for men from the city. Dramatic growth of commerce on the Philadelphia waterfront eventually prompted the Board of Harbor Commissioners, the Board of Trade, and the Pennsylvania Railroad to call for removing the islands from the river so that the port might better compete with New York. If Smith’s and Windmill Islands could be eliminated, warehouse piers on the Delaware could be lengthened from 150 to as much as 500 feet, and the shipping channel could be dredged to the depth and width necessary to accommodate larger-hull, cargo-filled ships. Throughout the 1880s, city, state, and federal governments discussed the financial, legal, and logistical measures necessary to remove Smith’s and Windmill Islands. In 1891, the Army Corps of Engineers contracted with American Dredging, a Philadelphia company, to do the work, and within two years, fourteen dredging machines began the process. Dredged material was deposited on League Island and in its back channel in South Philadelphia. Some also went to Petty Island. By 1897, Smith’s and Windmill Islands were completely gone. Francis J. Ryan is Professor and Director of American Studies at La Salle University. He was born and raised in the Harrowgate section of Philadelphia. Dorwart, Jeffrey. Camden County, New Jersey: The Making of a Metropolitan Community, 1626-2000. New Brunswick, N.J.: Rutgers University Press, 2001. Jackson, Joseph. Encyclopedia of Philadelphia. Harrisburg: National Historical Association, 1931. Kyriakodis, Harry. Philadelphia’s Lost Waterfront. Charleston, S.C.: The History Press, 2011. Mauger, Edward A., and Bob Skiba. Lost Philadelphia. London: Pavilion Books, 2013. Prowell, George Reeser. The History of Camden County, New Jersey. Philadelphia: L.J. Richards, 1886. Watson, John Fanning, ed. “Volume III,” Annals of Philadelphia and Pennsylvania in the Olden Times; Being a Collection of Memoirs, Anecdotes, and Incidents of the City and Its Inhabitants, and of the Earliest Settlements of the Inland Part of Pennsylvania. In Three Volumes. Philadelphia: J.M. Stoddart & Co, 1879, 470-471. “Appendix G: Report of Major C.W. Raymond, Corps of Engineers,” in Annual Report of the Chief of Engineers, United States Army, to the Secretary of War, for the Year 1891 in Six Parts. Washington: Government Printing Office, 1891, 1049-1050. “Away with the Islands: Commerce, Councils, and Congress to Improve the Harbor,” Philadelphia Inquirer, November 30, 1887. “Regatta on the Delaware,” The Daily Age, June 16, 1864. “Ridgway Park” The Philadelphia Inquirer, April 30, 1880. “Ridgway Park to be Abandoned as a Summer Resort,” Sun, August 21, 1888. Smith, R. Rundle. “Brief of the Title to Smith’s or Windmill Island in the River Delaware,” The Pennsylvania Magazine of History and Biography, Vol. 22 No. 4 1898: 423-435. “The Sanitarium at Point Airy,” North American, July 15, 1878. Maps, Manuscripts, and Archival Materials, Independence Seaport Museum, 211 S. Christopher Columbus Boulevard, Philadelphia. Castner Scrapbooks, “Smith and Windmill Islands in the Delaware River: Three Newspaper Articles,” Print & Picture Collection, Free Library of Philadelphia (Parkway Central Library), 1901 Vine Street, Philadelphia. Riverlink Ferry, Columbus Boulevard and Walnut Street, Philadelphia. 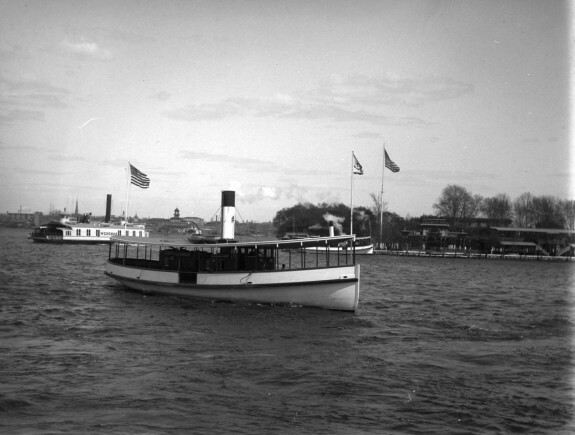 Smith’s and Windmill Islands were dredged away by 1897, and the Penn’s Landing terminus of Riverlink Ferry is directly across from where the canal was dug in 1838, creating the two distinct islands. I have been searching for this a LONG time. I am annotating a diary of a Lewes Delaware Pilot. When he visited Philly, he stayed here. THANK YOU!! !